Yesterday evening, I started my new university course about Content Management Systems for this winter semester. My CMS course is about the huge variety of challenges when working with Content Management Systems – in professional work and in theory. Content Management is not at all only about setting up and running a Typo3 instance (this is indeed the first thing where I always have to tear down my students’ wall of misbelief). 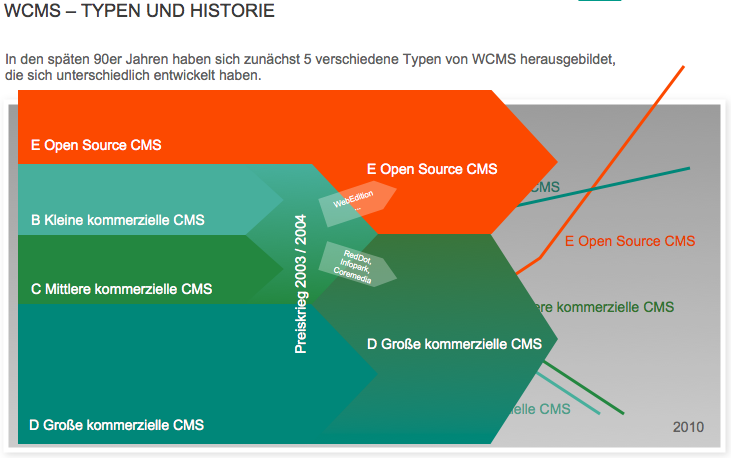 The world of CMS is more, much more. The audience of my course are studying business informatics – they are therefore, as myself, working in future often at the interfaces of technical projects. For this reason, it is crucial that my course is not only on technical issues like installing and programming a system, but also on how to set up a functional and creative concept of a CMS project or how to steer such a project as a project manager. Nevertheless it is also crucial to understand the big differences between commercial and non-commercial, static and dynamic systems, and to understand how Content Management Systems have historically developed within the last years. Of course, at the end we will install a Typo3 and a wordpress instance and play with it – after we have illuminated the whole world of CMS. I’m really looking forward to turn on the lights.